Eye-catching decorations? Check. Clever cake toppers? Check. Goofy games? Check. Well-informed, witty conversation? With our printable party kits infused with fun and fascinating trivia from our friends at Mental Floss, that goes without saying! They offer the memorable experience of a party where geeking-out is encouraged, and a smart theme is the main attraction. With our computer-themed kit, home is where the Wi-Fi is...and the site of a gloriously geeky gathering. It features custom "software" such as ironic emoticon party hats, "have a byte" rainbow cable cake toppers, and home address (127.0.0.1) treat bags that invite guests to "take me home." 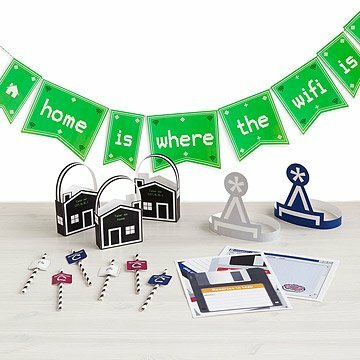 Featured throughout these clever components, Mental Floss factoids help boot up a nerdy party for your IT crowd, from startup to shutdown. In between bites of cake, contemplate the fact that half of a byte (4 bits) is called a nibble, toast to the wonders of Wi-Fi (which is banned in Green Bank, West Virginia), and delight in the fact that Google's first-ever storage device was made out of LEGO blocks. Recommended for ages 5 to 105. Click here for your free download of the Printable Party Kit - Computer Geek.